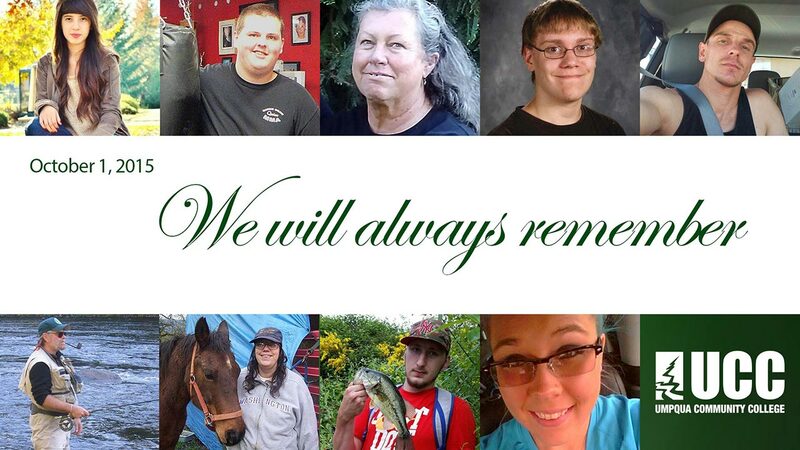 This site is a virtual memorial to acknowledge and honor those lost and affected by the tragic events that took place at Umpqua Community College on October 1, 2015. On that day, an instructor and eight students—ranging in age from 18 to 67—were tragically taken from their loved ones and from our community. Twelve students survived, eight of whom were wounded. The events of Oct. 1 will always be a part of our history. We will remember that day every day. Each year, UCC will hold a Day of Remembrance to pay tribute to those we lost and those who survived. UCC held its second Day of Remembrance ceremony on the campus grounds on Friday, Sept. 29. Governor Kate Brown approved the campus’ request to fly the flag at half-staff from that Friday through Sunday, Oct. 1. A tribute to survivors and those lost was also displayed around the campus flag pole. Nine wreaths made from fresh flowers of all colors were each displayed with a name and a candle lit in each person's honor. A private ceremony for UCC staff and students, affected family members, and the law enforcement community was held at the Compass. Two bagpipers from the Eugene Highlanders played while a small crowd of 150 gathered to pay their respects. A moment of silence was observed at 10:38 a.m. The ceremony ended shortly after a bell tolled nine times.